The ELINT/SIGINT satellites known for decades only as "Heavy Ferrets" are now known to be a program originally associated with the Samos (Satellite and Missile Observation System) project. This first series of Heavy Ferrets was called Program 102 and later Program 698BK. These satellites were designed to detect, map and investigate SAM and ABM radars. P-102 Group 0-D used an Samos F-1 payload and Agena-B stage inherited from the cancelled third Samos E-1 mission. The Group 0 digital payload was based on vacuum tubes and mechanical scanners. The operational digital ELINT payload was an all-solid state system, which had many advantages over the vacuum tubes and mechanical scanners of the Group 0 payload. In addition to extended frequency coverage, this system was much lighter, more reliable, and used considerably less power. The frequency range from 59 to 12,500 MHz was covered in three configurations (Groups 1-D through 3-D). An analog payload (Group 1-A) to examinate the operation of new Soviet ABM and ground-to-air radars was also planned, but was only flown later during the second phase of the program. The lifetimes of the early vehicles were limited to between 6 and 10 days depending on the weight of the batteries that could be carried. The Group 0 digital mission, P-102 Group 0-D, vehicle 2301, mission 7151, was launched on 21 February 1962 from Vandenberg AFB. 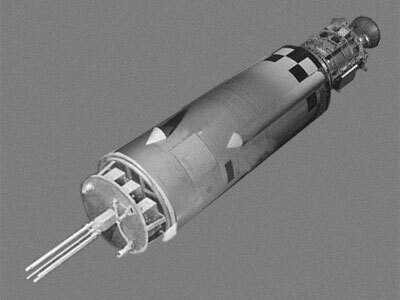 The tube-type F-1 receiver operated successfully for six days in orbit until the spacecraft batteries were depleted and the mission was terminated. It became the first Project 102 mission to collect data from the Soviet Union. The P-102 Group 2-D 1 mission, Vehicle 2312, mission 7152, was launched on 18 June 1962 carrying the first Project 102 Group 2-D digital payload. Expectations for a long, useful life, however, were dashed on the second evening of operation, when an erroneous command damaged the data recorder. Between the second and third flight, the project designation was changed to Program 698BK. The next flight, P-698BK Group 1-D 1, vehicle 2313, mission 7153, with a Group 1 digital payload, launched on 16 January 1963 was successful. However, the mission lasted only two days due to a battery failure, but collected data on Soviet radar sites. The fourth mission, P-698BK Group 1-D 2, Vehicle 2314, mission 7154 was a Group 1 digital payload, which was launched on 29 June 1963 using a TAT booster, as did all subsequent 698BK launches. It established a program record of 10 days of orbital operations and produced approximately 140,000 good intercept words. Additionally the Plymouth Rock 2 (Aftrack 34/Mission 7208) SIGINT payload, a general search payload in the 2000-4000 MHz band, was carried on the Agena. This series was continued with Agena-D based P-698BK satellites.